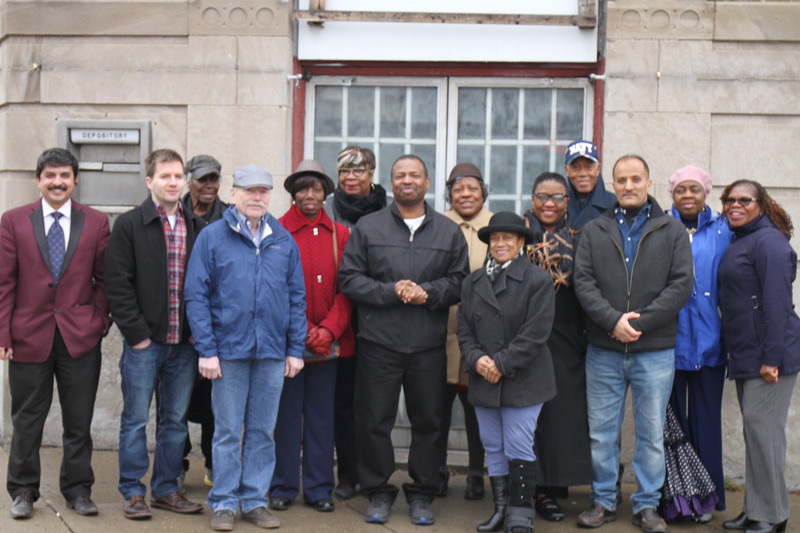 The newly formed Kensington Bailey historical committee pose with Councilmember Rasheed N.C. Wyatt in front of the historical Kary Building, one of the district’s Art Deco architectural treasures built as a Liberty Bank branch, circa 1938. Inspired by the legacy the Kensington-Bailey area played in the growth and development of Buffalo and the American experience, University District Councilmember Rasheed N.C. Wyatt has announced the creation of a Kensington-Bailey Historical Committee comprised of residents passionate about renewing the area’s character to reflect its uniqueness and diversity. KTA Associates, a historic preservation consulting firm, is working with the committee through a Preservation League of New York State grant awarded to the University District Community Development Association, Inc. (UDCDA). At the last committee meeting, KTA Preservation Specialist Annie Schentag presented an informative session on the history of district from its evolution from farms, timberland and the completion of the Kensington Avenue trolley in 1895 to post World War I when private real estate companies developed residential neighborhoods. Academically trained as both an architectural historian and an urban planner, Schentag has extensive experience in researching and writing National Register nominations, conducting Section 106 Compliance projects, and architectural reconnaissance surveys. Her work has thus far listed over 1,000 properties on the National Register of Historic Places in Buffalo, NY. “The work of the historical committee coupled with the ongoing research and survey work of kta preservation specialists has the potential to strengthen our community’s unique heritage while also supporting homeowners and encouraging small scale reinvestment in the neighborhood through tools like historic tax credits. Historic preservation has been an engine for Buffalo’s revitalization, and Kensington-Bailey has no shortage of buildings or stories worth preserving.” said Darren Cotton, Director of Community Development & Planning at the University District Community Development Association, Inc. (UDCDA). “Short-term plans are to continue to research places of historic significance and collaborate with local and state preservation agencies in conducting surveys, reporting sites and tracking progress,” said Doris Corley, University District Senior Legislative Assistant and Committee Chair. “Future projects in the pipeline include producing video documenting residents’ stories of the uniqueness of Kensington Bailey neighborhoods and launching a website.” This is a huge undertaking that is worth the time and effort for such a vibrant and diverse neighborhood. The committee is seeking more members interested in preservation and promoting appreciation of these neighborhoods. We are seeking residents, youth and businesses who live in the Kensington Bailey neighborhoods who want to share in its history. Meetings take place the second Monday of each month, 4 PM at Clevehill United Methodist Church 546 Eggert Rd. Buffalo, NY. If you’re interested, please contact the University District Council Office at (716) 851-5165.